Luanda — The Angolan authorities last Wednesday in Luanda denounced an alleged campaign intended to undermine the good relations between Angola and the Democratic Republic of the Congo (DRC). On a note that has reached ANGOP, the Ministry of Foreign Affairs states that with a view to clarifying the issue, the institution invited the DR Congo ambassador, Didier Kazadi Nyembwa, to its head-office and updated him about the "Operation Transparency", taking place mainly in Angola's eastern provinces. The operation, being conducted by the National Police, is focused on fighting illegal exploration of the country's mineral resources and illegal immigration. The meeting was attended by the secretary of State for Foreign Affairs, Domingos Custódio Vieira Lopes, and the secretary of State for the Interior, Bamukina Zau. The Congolese diplomat received clarifications regarding the "Operation Transparency". 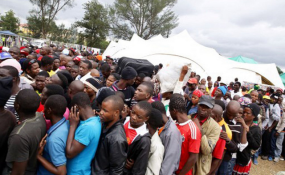 He was assured that the operation is not targeting exclusively citizens from the DR Congo, but all foreign citizens with an illegal migratory situation in the provinces of Malanje, Bié, Moxico, Zaire, Lunda Sul and Lunda Norte. The Angolan officials explained that the operation is also dealing with Angolan citizens that are involved in illegal prospecting of minerals in the mentioned areas. The two Angolan officials also explained to the Congolese diplomat that the video being shown in the internet, which insinuates that Congolese citizens are being tortured in Angola in the ambit of the operation, is part of a vicious campaign intended to undermine the bilateral relations. On his turn, ambassador Didier Kazadi Nyembwa thanked the Angolan officials for the clarification he received and pledged to pass a truthful information on the issue to his country's government. He also assured that despite the incident, which is receiving a lot of publicity in the social media, the relations between Angola and DR Congo will continue to be good and there will be no retaliation from his country.